In 1903, a very strange sideshow opened for business on Coney Island. Home to strippers, sword swallowers, shooting galleries, animal pageantry, freak shows, and thrill-rides that threw young lovers screaming into each others’ arms, Coney Island was the summer playground for New Yorkers—affectionately known as Sodom by the Sea. 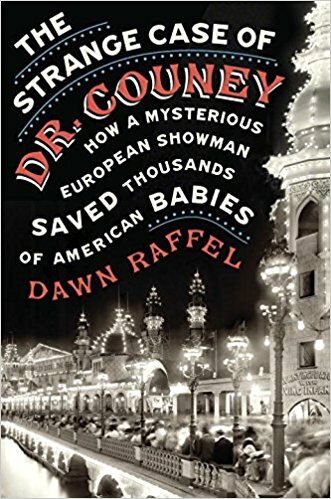 The show’s proprietor went by the name of Dr. Martin Arthur Couney, and for the next 40 years, while other attractions came and went, he would continue to show tiny preemies on Coney Island and at the Atlantic City Boardwalk (home to the Miss America Pageant and the Heinz Pickle Pier). 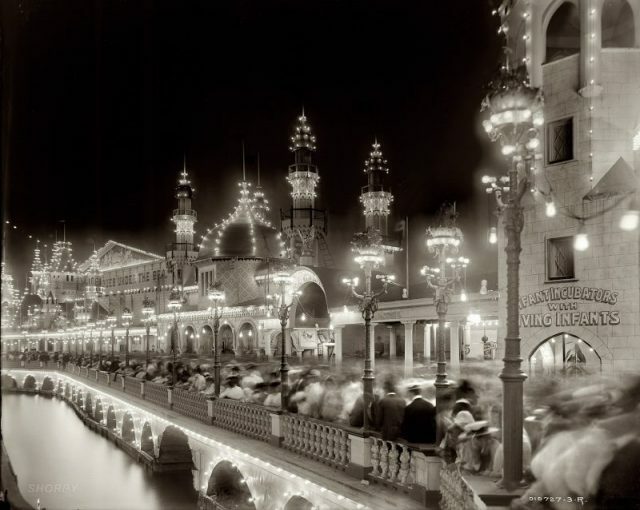 Coney Island, c.1903. To the right, you can see the infant incubators, while to the left is Under the Sea. Photo, courtesy Dawn Raffel. He also held shows on the midway of major world’s fairs, including those held in Chicago, New York, San Francisco, Buffalo, and Omaha. 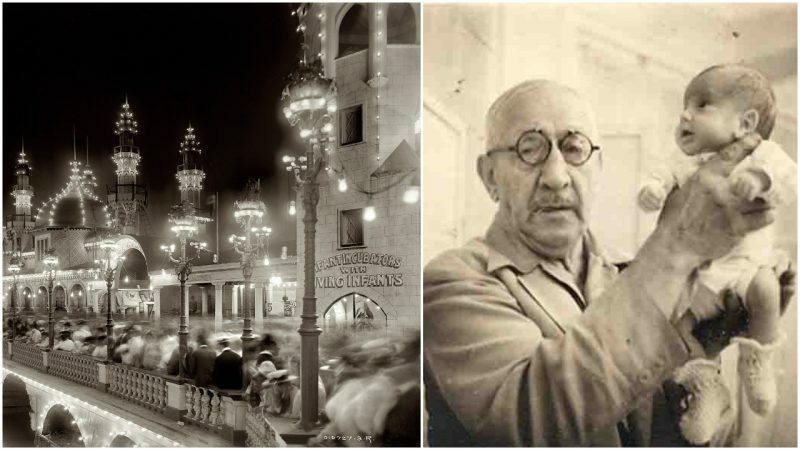 Plus, he had satellite outposts in amusement parks in Minneapolis, Denver, Chicago, and other cities. As time went on and his fame grew, the mysterious Martin Couney continued to burnish his credentials. He claimed he was born in Alsace, earned medical degrees in Liepzig and Berlin, and served as the hand-chosen protégé of a world renowned (and conveniently dead) French pediatrician named Pierre Constant Budin. It was Dr. Budin, he said, who first sent him to exhibit premature babies, at the Berlin Industrial Exposition of 1896. This incubator show was dubbed Kinderbrutanstalt (literally, child hatchery)—and before it even opened, it had inspired German drinking hall songs. The show’s purpose was to demonstrate the newly invented infant incubator, and it was a sensational success. But exactly why Martin Couney then left Europe for America’s boardwalks was something he never made clear. Young Martin Couney around the turn of the century. Photo, courtesy Dawn Raffel. In truth, Dr. Martin Couney fabricated almost everything about himself, including all three parts of his name—prefix, first, and surname. He was born Michael Cohn in Krotoschin, Prussia (now Poland), and quietly arrived in New York at the age of 18. But in America, Martin Couney stayed in business because was decades ahead of the medical establishment. 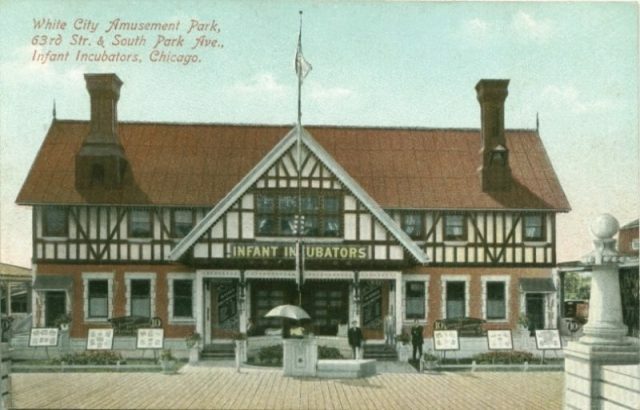 New York and Atlantic City-area doctors who had their patients’ best interest in mind strongly urged parents to send their newborns to the boardwalk as their best and often only hope. Martin Couney liked to say he was “making propaganda for preemies,” showing the public these children could be saved, endlessly wining and dining physicians in the hopes of persuading them. He was extravagant and charismatic, a glad-hander and gourmet, ready to pick up any check. But his ideas might not have caught on were it not for his friendship with a Chicago physician named Julius Hess. 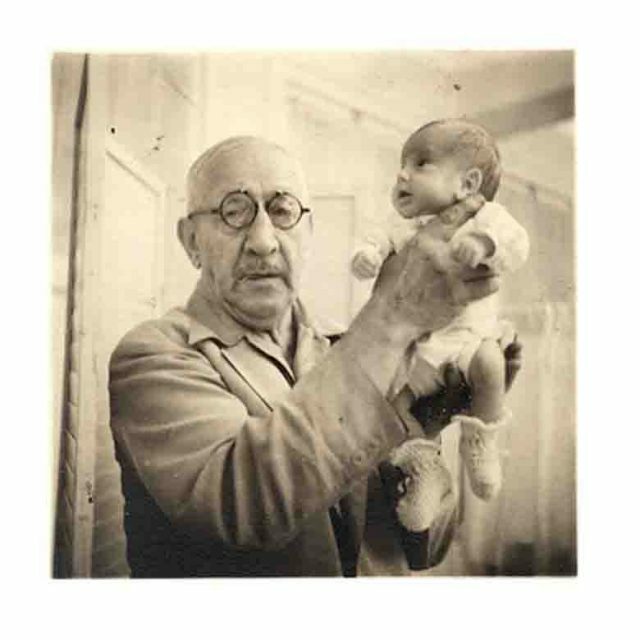 Martin Couney in 1941, holding a baby who was born weighing one pound, ten ounces. Today that baby, Beth Allen, is alive and well. Photo, courtesy Dawn Raffel. In 1933 and ‘34, the two friends joined forces at the Chicago World’s Fair in order to show the nation that preemies could—and should–be saved. With the city’s health commissioner and the editor of the Journal of the American Medical Association on their side, they broadcast coast to coast. The following year, Chicago became the first American city with comprehensive care for preemies as public health policy; eventually, Chicago became a model for the rest of the country. Unfortunately, the bang was a bust. Almost all the concessionaires lost money, and Couney, who’d funded his exhibit personally, with no investors, went flat broke. He died in 1950, penniless and largely forgotten. The enduring happy ending is that over the course of his career, Martin Couney saved the lives of 6,500 to 7,000 children. Some of them are still alive. He is the rightful father of American neonatology—a shyster and a savior; a bold, outrageous outsider who loved life and who did what physicians could not.